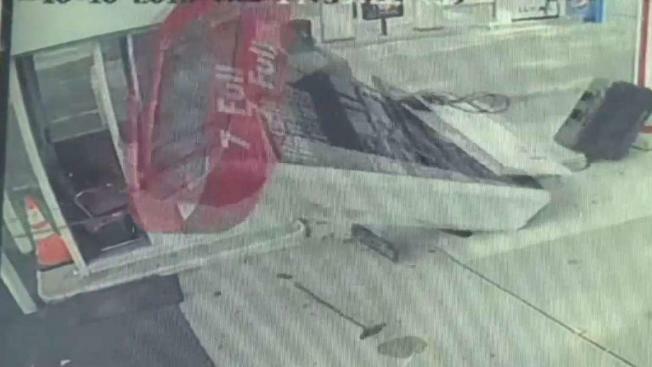 An SUV leaves a gas station in New Jersey, with the pump still inside the vehicle, breaking the pump and sparking a fire. Ida Siegal reports. A fire was sparked at a Bergen County gas station Wednesday afternoon after a driver pulled away from the pump too early, fire officials say. Dramatic surveillance video shows an area of the 20 Route 4 E Lukoil station in flames after the driver pulled away, causing the pump to break from the base and vapors to ignite from the gasoline. A large fire was ignited at a gas station in Hackensack, video shows. No one was hurt in the fire, the Hackensack Fire Department said. By the time firefighters got there, the blaze was out and the driver was still on the scene, with the pump still in her car.